Despite not being a runner herself, Ortman understood the importance of quality footwear. So, she put a message on a couple listservs and heard from people who wanted to be involved in getting the girls shoes, she said. The Girls Gotta Run Foundation became a nonprofit in 2006 and worked with other running organizations before establishing its scholarship programs. For several years, there were no paid staff, and when Ortman brought Nolan — now executive director — on board as director of outreach and development, she told her, “You’ll have to raise your own salary,” Ortman recalled. Ortman already knew Nolan, as the Girls Gotta Run Foundation had supported Nolan on a fellowship trip to Ethiopia when she was a college student. Gaby Grebski, who serves as secretary on the Girls Gotta Run Foundation board, has had the opportunity to visit Ethiopia three times, and remembered how the girls were surprised to see her back again — as many who visit just do so once — and invited her to their homes for meals. At the times she visited, the Girls Gotta Run Foundation was focused on different programs than it is today, although they were still connected to running. Grebski coaches cross country at St. John’s College High School and has been coaching in the Washington, D.C., area for 15 years. 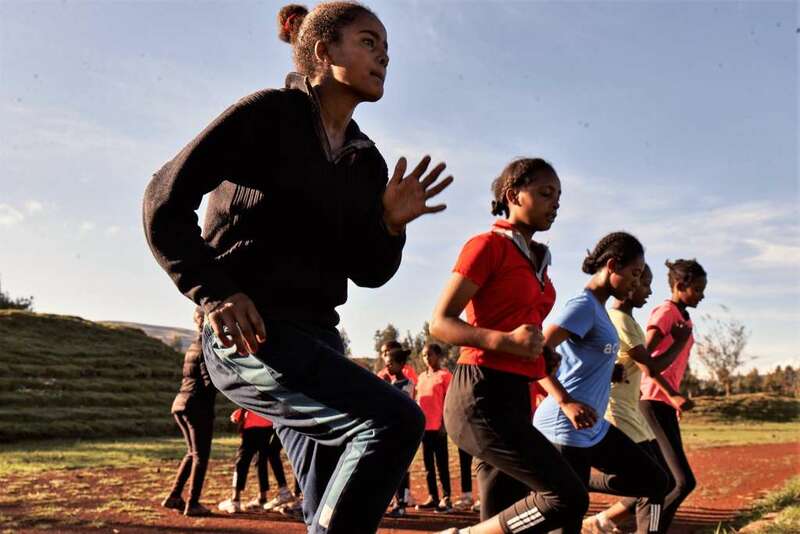 A runner since about the age of 12, Grebski knows firsthand the positive effects running can have — such as confidence, which is something the Ethiopian girls can gain through running, too, she said. In Ethiopia, running has life-changing benefits. The Girls Gotta Run Foundation athletic scholarship program began in 2014, and the first 15 girls who have graduated from it are still in school and not married, Grebski said. It’s important to get the girls into the program at the right age — about 12 — before they drop out of school, she said. It’s a three-year scholarship for each girl, and while there are girls from the ages of 11-18, the average age is about 12-14, Grebski said. After a certain point, school is not free in Ethiopia, and if a family has to choose between sending a son or daughter to school, it would be the son, she said. There is criteria for the scholarships, and the girls have to want to be in school and be interested in running, she said. Once in the program, some of the life skills they learn include money management and health and hygiene, she said. The Girls Gotta Run Foundation also employs Ethiopian locals, Grebski said. This includes Coach Fatia, Bekoji’s first woman to serve as a coach, according to the nonprofit’s website. Grebski also said the Girls Gotta Run Foundation doesn’t swoop in with its own agenda; it works with Ethiopian government agencies and organizations. Nolan lived in Ethiopia for about four years and has been able to see what life is like for families there. “The girls and women we work with face extreme challenges with grace and grit every day,” Nolan wrote. These challenges can include a lack of consistent access to water, electricity or internet; not having enough food, clothes or shoes; a long walk to school; and large families that can make it difficult for all children to go to school, she wrote. “It’s an honor to provide the tools and resources that these families and girls need to overcome the challenges before them and design a life of their choosing for the future,” Nolan wrote. The public can help, too. To fund an athletic scholarship for an Ethiopian girl and her mom through the Girls Gotta Run Foundation, it is $50 per month or $600 per year. Other donations are accepted as well, and a list on the nonprofit’s website shows how far dollars can go — from $10 for a sport shirt to $60 for a month of food, and beyond. To learn more, visit www.GirlsGottaRun.org or email Nolan at [email protected].